Long waits for core specialized services have consistently been identified as a key barrier to access. Governments and organizations at all levels have responded with strategies for better wait list management. While these initiatives are promising, insufficient attention has been paid to factors influencing the implementation and sustainability of wait time management strategies (WTMS) implemented at the organizational level. A systematic review was conducted using the main electronic databases, such as CINAHL, MEDLINE, and Cochrane Database of Systematic Reviews, to identify articles published between 1990 and 2011 on WTMS for scheduled care implemented at the organizational level or higher and on frameworks for analyzing factors influencing their success. Data was extracted on governance, culture, resources, and tools. We organized a workshop with Canadian healthcare policy-makers and managers to compare our initial findings with their experience. Our systematic review included 47 articles: 36 related to implementation and 11 to sustainability. From these, we identified a variety of WTMS initiated at the organizational level or higher, and within these, certain factors that were specific to either implementation or sustainability and others common to both. The main common factors influencing success at the contextual level were stakeholder engagement and strong funding, and at the organizational level, physician involvement, human resources capacity, and information management systems. Specific factors for successful implementation at the contextual level were consultation with front-line actors and common standards and guidelines, and at the organizational level, financial incentives and dedicated staffing. For sustainability, we found no new factors. The workshop participants identified the same major factors as found in the articles and added others, such as information sharing between physicians and managers. Factors related to implementation were studied more than those related to sustainability. However, this finding was useful in developing a tool to help managers at the local level monitor the implementation of WTMS and highlighted the need for more research on specific factors for sustainability and to assess the unintended consequences of introducing WTMS in healthcare organizations. Are there existing frameworks to identify potential explanatory factors for WTMS success at the organizational level? What contextual and organizational factors can influence the success of WTMS implementation at the organizational level for scheduled care? What contextual and organizational factors can influence the success of WTMS sustainability at the organizational level for scheduled care? Are those factors valid for the Canadian context? How can identifying such factors contribute to developing a tool to support managers in implementing and sustaining WTMS at the organizational level? The systematic review was limited to published articles. Six electronic medical databases were searched: CINAHL, the Cochrane Central Register of Controlled Trials, the Cochrane Database of Systematic Reviews, Embase, Healthstar, and MEDLINE (including MEDLINE In-Process). We consulted 19 electronic non-medical databases, which included general Canadian databases (Canadian Business & Current Affairs; Canadian Newsstand; Canadian Periodical Index; Canadian Research Index; Repères), math and engineering databases (Compendex; IEEE Xplore; Inspec; MathSciNet), economics databases (EconLit & ERIC [CBSCO Host]), and sociological (Communications Abstracts; ERIC; PAIS; Social Sciences Abstracts; Sociological Abstracts) and multidisciplinary (ABI Inform; ProQuest Dissertations & Theses; Scopus) databases. We used the search terms ‘waiting lists’ [or] ‘wait time’ [or] ‘queues’, combined using the Boolean operator and with terms reflecting management issues, such as ‘policies’, ‘information systems’, ‘budgets’, ‘health priorities’, ‘patient referral’, ‘health care delivery’, and ‘personnel management’. Additional search strategies to complement the search outlined above were developed for both medical and non-medical databases to ensure that we captured all relevant articles on WTMS. One example of the search strategies used is given in Table 1. This search strategy was developed and used for the Cochrane Central Registry of Controlled Trials, Healthstar, and MEDLINE medical databases. The systematic review was carried out over two periods of time. The first search, conducted in 2005, covered articles published between 1990 and 2005, and the second search, conducted in 2011, covered those published between 2006 and 2011. We conducted a workshop in March 2009 with healthcare experts to validate the first findings of the systematic literature review and to ensure they were robust. We conducted our review in two steps because most of the articles retrieved in the first period were related to WTMS implementation, but workshop participants felt it would be important also to include articles related to WTMS sustainability. Consequently, we extended our research until 2011 to capture such articles. We also explored together how the factors identified could be developed into best practices to create a tool for managers in healthcare organizations responsible for WTMS. Participants were selected because they had responsibility for healthcare provision, health system leadership, and wait time management, were in a position to provide experience-based critiques, and could potentially apply the research findings in their context. The data from the systematic review are presented here in narrative form because of the heterogeneity of study designs in the articles examined for our systematic review. The articles reviewed used a wide variety of study designs and approaches, including case studies, pre-post comparisons studies, prospective studies, simulation/modeling studies, and time series studies. We combined the findings of the two periods, specifically identifying factors that emerged in relation to WTMS implementation or sustainability. We adapted Parson’s social system action theory to classify the factors . This framework, which we used in previous work to identify contextual and organizational factors , was also useful to identify a priori coding categories , which is helpful when conducting reviews of qualitative studies. This framework (Figure 1) is composed of different factors that can be present at the contextual and organizational levels: ‘governance and leadership’, defined as ‘the conduct of collective action from a position of authority’ ; ‘culture’, which consists of ‘underlying beliefs, values, norms and behaviours’ [13, 16]; ‘resources’, which may be human, financial, infrastructural, or informational; and ‘tools’, referring to instruments or procedures. The organizational level corresponds to the specific context of WTMS initiatives within healthcare organizations, whereas the contextual level refers to the broader context of WTMS initiatives, such as policies, laws, or regulations from provincial, regional, or other health authorities. We applied the following four inclusion criteria:We had no inclusion criteria related to study design; all study designs were included. Articles published between 1990 and 2011. Articles that focused on transplantation, emergency care, and psychiatric care were excluded because their wait time management differs significantly from that for scheduled care. We also excluded opinion papers and papers with no mention of the study design. Data extraction was qualitative and was performed by five members of the research team using SRS (TrialStat). The software monitored the Kappa data extraction from the five extractors, and discussions among extractors were regularly organized if necessary to reduce any inconsistency between reviewers. In addition, the principal investigator reviewed all abstracted data. The extraction form was a custom-designed template that had been tested on a sample of articles. The following main categories of data were extracted: jurisdiction of WTMS, clinical area of WTMS, definition of wait time or wait list, description of WTMS, article objectives, study design, theoretical framework used, and factors influencing WTMS (categories of factors and their positive or negative influence on WTMS). Because the links between the factors and the success of the WTMS strategies were not systematically analyzed in the articles or quantified in any heterogeneous way, we decided not to include such analyses. Whenever possible, reviewers used quotes to describe wait time initiatives, and for all factors identified in the articles, added page and paragraph references. A search protocol for the systematic review was approved by the Canadian Institutes of Health Research and is available through the principal investigator. The search yielded 12,779 references; after elimination of duplicates, 6,176 remained. 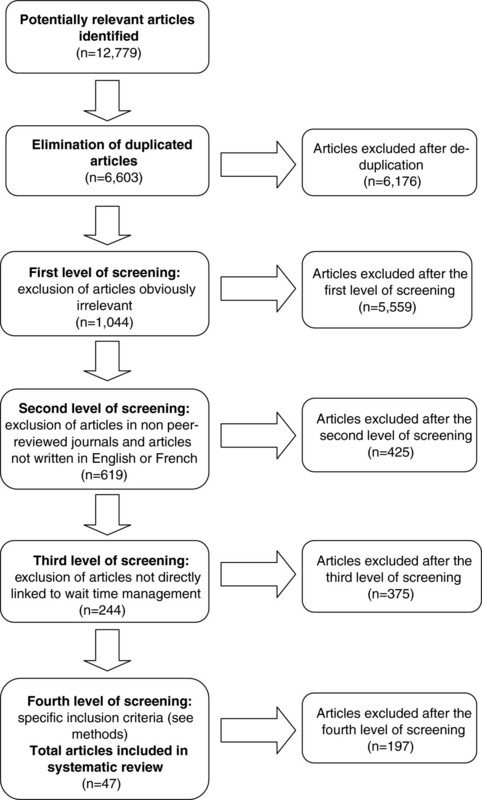 Four levels of screening were conducted in duplicate by two reviewers using the web-based systematic reviewing platform SRS (TrialSat). The first level excluded all articles obviously irrelevant based on abstracts. The second level excluded articles in non-peer reviewed journals and those written in languages other than English and French. With 619 references remaining, the third level consisted of reviewing the titles and abstracts with the same criteria used in the second level, this time excluding articles not directly linked to wait time management. For the remaining 244 full articles, in the fourth level of screening, the research team applied the specific inclusion criteria for articles described above. In the end, 47 articles were retained and abstracted (Figure 2). Flow diagram of the search and selection process. Of these 47 articles, the vast majority (n = 45) were empirical studies, and the remaining two used a theoretical approach. Approximately one-third of the empirical studies were single case studies (n = 17), some were pre-/post-strategy comparisons (n = 9), others combined a case study with a survey (n = 7), some were multiple case studies (n = 6), a few were simulation/modelling (n = 3), and the rest were time series (n = 3). Two-thirds of these 47 articles were from Canada (n = 15) and the United Kingdom (n = 15). The rest were from Australia (n = 4), Sweden (n = 4), the Scandinavian countries (n = 4), New Zealand (n = 3), and the United States (n = 2). One explanation for the low number of articles from the US might be that the country faced fewer challenges regarding wait times than did other OECD countries. From the systematic review, we identified different types of WTMS in terms of the levels at which they were launched, i.e., at the local level in a healthcare organization or at a broader system level (national, provincial, or regional). At the local level, strategies included work reorganizations (n = 8), increases in capacity (n = 2), implementation of pre-operative clinics (n = 2), and development of data collection software, including simulations of wait lists (n = 3) and booking systems (n = 1). At the national level, strategies included booking systems (n = 6), maximum wait time guarantees (n = 4), and development and use of prioritization tools (n = 11). Table 2 summarizes the different WTMS identified in the articles. These covered a broad range of clinical areas, including orthopaedics (n = 7), eye care (n = 7), and cardiac care (n = 6), and many covered general surgery (n = 23) or spanned multiple specialties (n = 4). Our search uncovered no studies in medical imaging, even though this area was specifically included in our research question, as wait times in this area have been identified as a problem. Among all articles abstracted, only two, by the same authors, offered a framework for studying factors that influenced the implementation of WTMS, in this case the implementation of a booking system [17, 18]. Published in 2003, the study collected and analyzed quantitative and qualitative data from 20 pilot organizations in the United Kingdom to identify essential conditions for successful implementation of quality improvement initiatives in healthcare. The framework grouped the factors under six categories. Two of the categories, ‘national context’ and ‘local context’, acknowledged the need to look at the system on more than one level. This is also acknowledged in our model/framework. The authors also identified the categories ‘culture’ and ‘capacity’, which we have named ‘culture’ and ‘resources’. Another of their categories is ‘roles of physicians’, which, as in our study, emphasizes doctors’ key role. Lastly, their category ‘mechanisms of change’ covers a collection of factors, all of which have been classified in various dimensions in our own model. In the following sections, we begin by considering the factors associated with implementation at the local and contextual levels before presenting the factors associated with WTMS sustainability. A synthesis of all the factors is presented in Table 3. Leadership, related to governance, was the most frequently cited factor, found in 11 articles [17–27]. The other recurrent factor, seen in five articles [19, 20, 24, 28, 29], was the establishment of a dedicated decision-making and management structure to design and implement WTMS. Finally, accountability was also an important factor in four articles, two of which identified clinician accountability as key in implementing a successful strategy [22, 28], while three stressed the accountability of hospital boards and management [22, 23, 25]. Definitely the most recurrent cultural factors in the articles were related to physicians’ involvement and attitudes toward WTMS. Of the 13 articles that mentioned this factor [17, 18, 26, 30–39], seven stressed the fact that it can be a major barrier for WTMS implementation [18, 26, 30, 32, 33, 36, 38]. Lack of trust between managers and clinicians was cited as another important factor [17, 20, 22, 25, 40] that can have a negative impact. On a more positive note, some authors pointed out that WTMS implementation is also facilitated by an organizational culture of quality improvement [24–28]. The most common local-level resource factors mentioned in the literature were those having to do with flexibility and adequacy. Insufficient infrastructure resources were mentioned as a limiting factor in several articles [17, 18, 20, 31, 37, 40–44]. Capacity constraints, in relation to both operating rooms and post-surgery beds, hindered WTMS implementation . One study reported that surgical capacity had to be increased to meet wait time guarantees . Concerning human resources, many articles underscored the importance of having dedicated staffing. More specifically, several articles identified appropriate levels of dedicated staffing as a success factor for WTMS [17, 19, 20, 22, 23, 31, 41, 42],[44–51], and some reported on the positive impact of using non-medical staff (physician assistants, nurse practitioners, anesthesia assistants) on reducing wait times [24–26]. Concerning financial resources, some articles cited incentives at the individual or the unit level as contributing to successful outcomes. In Ontario, offering financial incentives for physicians to use tools specially developed for assigning priorities to surgical patients seemed to have a positive impact on reducing wait times [23, 39]. Disincentives were also powerful, as in Sweden, where hospitals that did not meet wait time guarantees ran the risk of being forced to send patients elsewhere at the hospitals’ expense [33, 52]. The most commonly cited tool was information management systems designed to meet the high information demands in WTMS initiatives. Examples included databases for recording information [18, 19, 25, 30, 31, 39, 41, 44],[53, 54] and scheduling software . Interestingly, it was noted that overly complex systems constituted barriers to WTMS implementation . Thus, simple, user-friendly, and effective solutions for information presentation were lauded, as was system flexibility in the case of information systems implemented across a region or country [31, 55]. It was also important that those concerned be able to access relevant data easily  and that the data be ‘clean’ . Training and support were another important tool cited. The increased use of quantitative information made it important for staff to be trained to analyze basic statistics and time series data, and to acquire a basic understanding of spreadsheets [31, 55]. Some articles pointed out the key role of peri-operative coaching teams in helping hospitals improve both clinical and organizational processes/practices for wait time management [24–27, 39]. 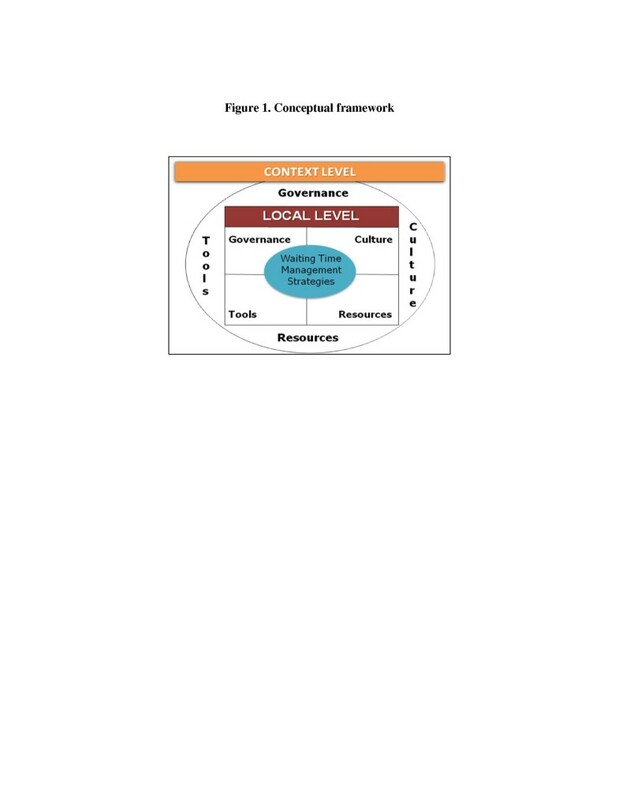 The first contextual-level governance factor highlighted by the systematic review was the need for high-level (i.e., central) coordinating, reporting, and monitoring structures [17, 21, 23–27, 32, 35, 37, 44, 54]. Several articles mentioned the need for such structures to provide guidelines and advice. Structures such as the UK’s National Patients’ Access Team  and Healthcare Commission  or Ontario’s Critical Care Expert Panel  positively affected outcomes at the organizational level. For example, the Critical Care Expert Panel provided advice on ‘methods to support a well-functioning critical care system that will minimize surgical delays’ . Reporting was also cited as a success factor [25, 32]; this refers to the healthcare organization’s obligation to monitor and present its data to the Ministry of Health or to an independent structure in charge of monitoring wait time. In particular, one article pointed out that, in Ontario, reports issued by the Ministry of Health on WTMS achievements  offer a certain degree of accountability to different bodies representing patients and more generally to the population. Still, those authors suggest that communication efforts should go further, providing more targeted information to educate the various stakeholders: boards, administrators, clinicians, and hospital staff . Another positive contextual-level government factor identified in the literature was the involvement of stakeholders, including professional associations [22, 25, 26], partners such as national or provincial health ministries [22, 24–27, 54], patients, and other stakeholders in the health network [22, 56]. Methods for involving stakeholders, which included soliciting them for information on data , advice on existing processes, ideas for improvements [25, 26, 32], and recommendations [24, 26], as well as ensuring systems for reporting , were seen as helpful for WTMS implementation. Another factor was related to accountability agreements. As highlighted in several articles [22–25, 44, 54], accountability agreements signed between government and hospital boards are a key element of Ontario’s wait time strategy. These agreements identify the hospital actors and make them accountable for equitable access to services in their organization. Leadership was also identified as a key factor in WTMS implementation. Several articles outlined the role of provincial and regional leaders in the positive development of WTMS [23–27]. One cultural factor seen at the contextual level was consultation with front-line actors. This factor surfaced as having contributed to the successful implementation of WTMS initiatives [17, 22–27, 32, 34, 36, 37]. An example of this was consultation with expert panels as part of Ontario’s Wait Time Strategy. Indeed, a key element of the strategy involved seeking front-line actors’ (clinicians, administrators, and researchers) advice on improving access [22–27]. These consultations helped to involve experts in the strategy and to enlist their support and involvement. Public awareness was also identified as a success factor in WTMS implementation. Several articles described government efforts to make available to patients clear information about wait time strategies [22, 23, 25, 39, 54]. These initiatives empowered patients by sharing knowledge about wait times . Developing a performance culture was also an important factor identified in the literature [22–25, 27, 54]. Common levers used by the Ministry of Health to create a performance culture included introducing financial incentives for physicians, monitoring data, and conducting assessments, audits, and hospital surveys, all with the aim of improving practices/process efficiency and effectiveness. Funding was by far the most recurrent positive contextual resource factor [17, 18, 22–27, 30, 32, 34, 35, 37],[40, 45, 48, 49, 52–54]. Higher level funding was provided for specific initiatives, such as strategies to address backlog [25, 26, 30, 32, 40, 49], initiatives to make practices more efficient and effective [23, 25], recruitment of medical staff , and specific purchases, such as information systems equipment for data collection [22, 23, 25] and new or updated medical equipment [22, 23, 25, 54]. Financial incentives based on performance were another contextual resource factor described in some articles [22, 23, 25, 26]. For example, in Ontario, hospitals were expected to meet a series of conditions to obtain funding for wait time cases. At the contextual level, tools included instruments or procedures that affected more than one organization, such as the development and implementation of standards and guidelines [22–27, 33–35, 40, 44, 52, 56]. Some procedures involved standardizing equipment across hospitals (e.g. MRI, CT scanners) [25, 26]. Others were related to standardization of practices [23, 25, 26]. Standardized wait time indicators were also identified as a contextual level tool [23–27]. Finally, collection and standardization of data was the most recurrent factor cited [22, 23, 25, 26, 33–35]. Implementation of a central registry was also seen as a tool to significantly reduce wait times [33–35, 37]. Training programs, whether in specific professional skills or management skills, were also mentioned in a few articles as a useful tool for implementing WTMS [17, 18]. Finally, the development of communication tools such as websites was also cited in some articles [22, 23, 25]. For example, in Ontario, the implementation of a website made it possible to provide the population, first, with general information on the province’s wait time strategy and, later, on specific medical specialties as part of the strategy. Accountability was the factor most frequently cited as a key component of WTMS sustainability [22, 57, 58]. Those working at the local level pointed out that accountabilities have to be explicit and must apply to all local stakeholders, including the general public and patients, healthcare providers, administrators, managers, and government. One article emphasized that each of these groups has a critical role to play in furthering the strategy’s momentum and developing a sustained culture for the future . Leadership was also cited in some articles as an important factor in sustaining a WTMS [22, 24, 57], with the point being made that leadership must be continuously provided by all local champions, such as boards of hospitals and local health organizations, hospital administrations, and medical management. Physician involvement was cited as a cultural factor influencing WTMS sustainability [22, 54]. According to these articles, it is important that physicians maintain momentum in meeting wait time accountability targets. One article described an open management style that supported physicians and engaged them in activities to improve quality and access . Finally, the need for cooperation between physicians and managers was also mentioned . Certain human resources issues that pose significant challenges to improving system capacity were identified in one article . The authors stressed that, to ensure WTMS sustainability, hospitals must develop effective recruitment and retention strategies in the relevant professions, where there have often been long-standing issues regarding supply. Wait time issues cannot be solved by improving clinical efficiency alone; any solution must also incorporate new ways of working. One article, for instance, described an innovative initiative to expand the role of physiotherapists in joint replacement programs . Finally, the need to provide patients with alternative treatment options was presented as a key dimension of sustainable WTMS . At the organizational level, the tool most frequently cited was the use of a performance or information management system [22, 24, 58–61]. These articles pointed out hospital managers’ need for appropriate information to assess their wait time performance, as well as tools for managing capacity, booking patients, and mapping peri-operative processes in order to predict maximum patient flow. Finally, training and support of human resources was another factor presented in the literature . In particular, this article mentioned the positive role of training staff in the use of common software and in data management. Leadership was the most important contextual governance factor cited [22, 24, 57, 58, 62]. As was pointed out in several articles, leadership at the higher levels is important to sustain a WTMS. Stakeholder involvement was another key factor [22, 27, 62] in sustaining WTMS, as were quality and safety measures, processes, and monitoring [54, 57]. Some articles considered an informed public to be an important factor in sustainability [22, 27]. Indeed, these articles highlighted the media’s important role in educating the public by communicating the content of public wait time websites, informing the public on how to use wait time information to discuss treatment options with care providers, and writing about the impact that consumer choices, behaviors, and expectations have on wait time. Financial incentives were identified as a key factor in sustaining WTMS [22, 25]. These articles highlighted the need to align hospital and physician funding mechanisms, since their different methods of payment represented a barrier to the sustainability of such strategies. Indeed, fee-for-service remuneration motivates physicians to treat as many patients as possible, whereas hospitals receiving global budgets are motivated to treat as few patients as possible. These articles outlined the need to align physician remuneration with government objectives to sustain wait time strategies. Performance-based payment was seen as an incentive to perform more procedures as efficiently and effectively as possible. Finally, the articles highlighted the need for appropriate funding for these measures [27, 62]. Electronic information systems were cited as a key to sustaining wait time initiatives [22–24, 61, 63]. Indeed, the availability of wait time information was seen as enabling decision-makers to assess the impact of investments in WTMS on access and on efficiency of service delivery. Another article also highlighted standardization of wait time data as a key sustainability factor . Public websites were cited as important tools for sustaining WTMS. Indeed, in some cases, communicating to the public about wait times included providing information not only on wait times for scheduled procedures but also on wait times for surgeons practicing such procedures . Table 3 summarizes all the factors cited. In March 2009, we organized a workshop that brought together 20 experts representing a cross-section of Canadian healthcare opinion and thought leaders. Participants were selected who had system and organizational level responsibility for healthcare provision, WTM leadership and/or health services research and education, and were in a position to provide experience-based critiques of WTMS. Participants included care providers, health system managers, policy-makers, and representatives of national associations of healthcare professionals and accreditation bodies. More recently, in a workshop at the Taming of the Queue conference in 2013, we were able to present and once again validate the results from our overall study. Solicit suggestions for future research opportunities and research settings. Workshop participants were asked to compare their experiences of WTMS and to identify success factors and constraints. Participants listed constraints and barriers to WTMS implementation and sustainability and ranked them in order of severity. Then they identified factors that improve WTMS implementation and sustainability. From this workshop, five main themes emerged. First, these healthcare managers and decision-makers had more to say about negative factors, namely constraints and barriers to WTMS, than about positive or success factors. Second, workshop participants brought forward new factors not identified in the literature that were specific to the Canadian context, particularly with regard to WTMS sustainability (Table 4). Third, they reported the same main factors for WTMS implementation as those identified in our systematic review, including leadership solutions at both the local and contextual levels (governance factors), payment incentives for physicians at the local level and funding at the contextual level (resource factors), change management support tools at the local level and standardized data at a higher level (tool factors). Table 4 presents the key barriers to both implementation and sustainability of WTMS initiatives. Fourth, they identified 10 main factors that improve WTMS implementation and sustainability (Table 5). This helped us to conceptualize, build, and test a tool to help managers implement and sustain WTMS at the organizational level. Finally, they stressed the fact that WTMS initiatives had been implemented across Canada ever since the September 2004 meeting of Canada’s First Ministers, and therefore by that time (2009) they had hoped to be seeing more studies on sustainability. Given that the first period covered by our systematic review ended in 2005, this last observation prompted us to extend our review in hopes of finding data on sustainability beyond that point. Ultimately, however, the data uncovered in the second portion of the systematic review did not really satisfy those expectations. Align agendas across healthcare organizations; focus on the patient. Increase communications among stakeholders, communicating at the right place and time and to the different levels of responsibilities. Establish a strong wait time management (WTM) data repository and ensure WTM data standardization; collect data about the impact of WTMS and identify gaps and goals; note that WTMS projects need to include change management, and that people, processes, and flows must be addressed. Clinical and administrative WTMS champions must form a partnership; the system must identify who these champions are, define and resource their roles and actions, and enable them to implement an operational plan. Engage and activate patients; make the current system dysfunctions transparent so that patients understand there are differences in wait times among physicians, and provide them with the option of being seen by the first available physician. Talk about what the health system is for and what the trade-offs are for immediate access. Create a system with incentives for clinicians that involves paying them for their time. Leadership is required in partnership with payers. Make sure the ministries of healthcare are at the table; otherwise the lack of relationship with them can become a barrier. As a parallel strategy, ‘expectations management’ is recommended around WTMS potential and limitations. From this systematic review of 47 articles, we were able to identify key factors influencing WTMS, especially for implementation. Few studies explored the determinants of WTMS sustainability [22–26, 57–63]. With regard to evidence-based healthcare programs and practices, two recent systematic reviews looked at factors that influence the sustainability of such initiatives [64, 65]. Most of the studies reviewed there did not define the notion of sustainability in clear terms, and most did not use a rigorous research design to evaluate research findings on factors impacting sustainability . Although that review found the same main determinants of sustainability as emerged in our review, the factors identified were less accurate than those we were able to show. For example, that review did not identify subcategories for factors related to the cultural dimension, such as performance culture, quality improvement, or public awareness and empowerment. Furthermore, the studies reviewed did not always link the determinants of healthcare innovations’ sustainability to their impacts on particular goals or on benefits for patients. Despite the lack of evidence in the literature on the notion of sustainability and its determinants, the discussions in the workshop helped to shed light on this notion. Indeed, the workshop allowed us to identify additional constraints and barriers related to WTMS sustainability (see Table 4). Moreover, the workshop participants’ notions concerning implementation differed from those identified in reviewed articles in two ways. First, the participants identified factors that negatively impacted WTMS implementation, in contrast to the success factors found in articles. They also identified factors, again negative, that were especially related to sustainability and were not in the literature. Most of those were related to governance at the local level, such as limited information sharing between professionals and managers, lack of time allocated to WTMS, and lack of partnership between professionals, especially physicians, and managers (see Table 4). Despite these differences, many of the factors identified in the literature and the workshop were similar, including those relating to implementation (see Table 4). As such, this process highlighted the importance of taking into account the potential limitations of using a theoretical framework for data extraction . Because the workshop experts were healthcare managers and decision-makers directly involved in wait time reduction strategies in Canada, their input helped validate the findings and robustness of our systematic review, in addition to complementing our findings with sustainability factors that were rarely addressed in the literature. We should also point out that an article published by our team in 2010 on a study of success factors in WTMS implementation showed the same main findings as did our systematic review . That study used data from interviews with key physicians, managers, policy-makers, and researchers from across Canada who had worked on initiatives to reduce wait times. The same governance factors were noted in that article, as were cultural factors related to physician involvement in WTMS and the need for a quality improvement culture. That study also highlighted the importance of aligning contextual-level and local policies. Funding levels and financial incentives were addressed both in that article and in our systematic review. As well, subsequent to that 2010 article and inspired by it, a very interesting tool was developed to assess the success of WTMS implementation, which was applied in an orthopedic program  (see Table 6). • ‘Improving Access’ poster presentation selected for Taming of the Queue, 2012 – Ottawa. • Participation in National Best Practice Initiative – Bone and Joint Canada: representation from all allied health disciplines, surgeons and medical staff. Some of the factors identified in our study have been mentioned in other Canadian and international studies published in the grey literature. For example, the Canadian Centre for Policy Alternatives (CCPA) report in December 2005  mentioned coordination, dedicated evaluation tools, commitment and cooperation by all stakeholders, and an innovative culture of performance as the main factors that can enhance the success of a WTMS. The March 2006 report of the Association of Canadian Academic Healthcare Organizations  and the June 2006 Final Report of the Federal Advisor on Wait Times  also mentioned some of the factors identified in our study, such as those related to physicians’ involvement in WTMS. Another publication, by the Health Council of Canada , reported that interviews with leaders of initiatives to reduce wait times in Canada had revealed a number of key success factors. Unsurprisingly, these are similar to the factors identified in our study and include: support from governments leaders; strong program leadership that brings together administrative and clinical champions; full-time staff who are dedicated to making the program work; information systems that enable programs to centralize wait lists, to track wait times in local areas and province-wide, and to share this information publicly; adequate funding for the introduction of information systems and effective program leadership; and a broad, comprehensive approach to the many large and small changes required to reduce wait times for care . At the international level, a study conducted by the King’s Fund in the UK  examined organizational characteristics that sustained WTMS improvements. Once again, some factors identified in our study were also in the King’s Fund report, such as the need for reliable information, strong leadership, and incentives, although our findings were more extensive. Our focus on the factors themselves, rather than on their impact on reducing wait times, was both a strength and a weakness. However, there are few studies on wait time reduction and on the success factors linked to WTMS impact on wait time. We did not establish a scale to measure the quality of evidence. Nor did we assess the quality of the research design for each study. Rather, we focused on our main objective, which was to identify the factors at different levels, and we used the conceptual framework to categorize each factor and to abstract all the articles in a consistent manner. Another limitation of our review was that it included only English and French language studies and those published in peer-reviewed journals. Nevertheless, we were also able to consult the grey literature and to discuss it in the workshop and in subsequent presentations at conferences. This is the first published review on factors that can influence success in implementing or sustaining WTMS in healthcare organizations. The conceptual framework used in this study is one that we previously used for a published study on success factors of WTMS implementation, which was based on interviews with physicians, healthcare managers, and policy-makers . Our framework, inspired by Parson’s widely recognized and robust four-quadrant model , was useful for organizing and analyzing the factors identified in the literature as influencing the implementation and sustainability of WTMS at both the systemic and local levels. The paucity of articles with evidence on sustainability points strongly to the need for more research in that area related to impact on WTMS. Since our systematic review did not explore how these individual factors influenced reduction of wait times, future research should focus on success factors that help to both implement and sustain WTMS and that ensure reduction of wait times. Nevertheless, our results can be useful to healthcare decision-makers and managers seeking to develop best practices based on success factors for WTMS implementation and sustainability. One example of such use is the tool presented in Table 5, which is a checklist of factors developed to support managers at the organizational level implementing a WTMS in one of the main orthopedic services of Ontario’s Eastern Regional Health Authority. This tool was shown, in a study, to have been a successful method of knowledge translation that contributed to the sustainability of that initiative . Marie-Pascale Pomey, MD, MSc, PhD, is an associate professor in the Department of Health Administration, Public Health Research Institute, Faculty of Medicine, University of Montreal. Pierre-Gerlier Forest, PhD, is president of the Pierre Elliott Trudeau Foundation. Claudia Sanmartin, PhD, is a senior researcher in the Health Analysis Division, Statistics Canada. Carolyn DeCoster, PhD, RN, MBA, is executive director for Clinical & Zone Analytics, Data Integration, Measurement & Reporting, Alberta Health Services. Nathalie Clavel, MHA, is a research assistant, IRSPUM. Elaine Warren, RN, MSc, is regional director of Surgical Services, Eastern Health, and program director of Critical Care, Eastern Health. Madeleine Drew, MHA, is a research assistant, IRSPUM. Tom Noseworthy, MD, PhD, is an associate chief medical officer for Strategic Clinical Networks and Clinical Care Pathways, Alberta Health Services. Medical Literature Analysis and Retrieval System Online. This research was funded by CIHR (IHSPR) through two operating grants and an emerging team grant. The co-authors thank Donna Riley for her significant contributions in translation and editing, and her careful re-reading, which helped bring greater clarity and focus to the article. The authors affirm that they have no competing financial or non-financial interests to declare. MPP was the PI responsible for leading the project. MPP, PGF, CS, CD, NC, and MD identified and analyzed the articles. MPP, MD, and NC wrote the first draft of the article. PGF, CS, CD, EW, and TN were involved in writing the final draft. All authors read and approved the final manuscript.